(P1) LG Innotek said Thursday it has developed a 15-watt wireless power charger that can supply electricity to devices as fast as a wired charger. (P2) The new power transmission module can fill 50 percent of an empty battery within 30 minutes, which is three times faster than existing 5-watt wireless chargers, the company said. The new charger will be mass-produced starting this year. (P3) LG Innotek said it expects the demand for wireless chargers to expand from homes and offices to automobiles and public places. (P4) “Our efforts to meet customer needs and market changes have resulted in success in developing the 15-watt wireless power transmission module,” LG Innotek’s automotive components and electronics laboratory head Park Gil-sang said in a statement. (P5) The company said it has upgraded not only charging speed but also compatibility and expandability of the device. The new wireless charger is compatible with diverse international standards including Wireless Power Consortium (WPC) 15W, Power Matters Alliance 5W and 9W power transmission modules, as it has been designed to meet the criteria set by the WPC and the AirFuel Alliance. 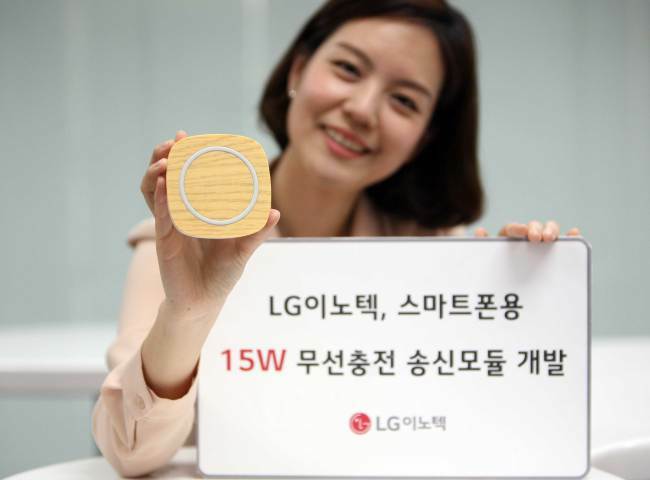 (P6) LG Innotek said the 15-watt wireless charger can be installed in automobiles because it has been developed under a strategic partnership with a major semiconductor manufacturer. (P7) LG Innotek started providing wireless power transmission modules for Google’s smartphone Nexus 4 in 2012 and has since sold them to handset makers including LG Electronics, Motorola, and Kyosera. It unveiled the 5-watt power transmission module with more than 70 percent charging efficiency last year. Would you buy this product? Why or why not? Why do some people always buy the newest technological devices, like smartphones? In the future will charging devices be able to provide a charge in less than 1 hour? What do the following expressions mean?